I had the privilege of meeting activist and blogger Jes Baker and receiving a signed copy of Things No One Will Tell Fat Girls book nearly a year ago when my college organization (The F-Word: Feminists Working on Real Democracy) brought her to our campus to give a lecture titled “Love Your Body, Change the World.” Drowning in a sea of homework, job obligations, and graduation stress, I told myself I’d read the book over the summer. Sure enough, summer brought along a whole new host of stress points, delaying my reading even further. But I’ve read it now, and I have SO many things to say about it. Once my job search ended and I fell into a solid routine, the first thing I wanted to do was to get back into a reading habit. Things No One Will Tell Fat Girls (shortened, from here forward, to Fat Girls) was the first book that I opened — and it was well worth the wait. The humor, honesty, and realness that Jes projects in person transfers seamlessly into her writing. And reading the book feels like 200-something pages of listening to your best friend in the whole world give you the best pep talk in the whole world. 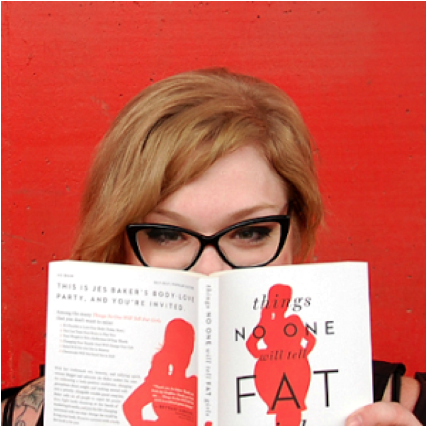 There is so much good information in Fat Girls, it’s hard for me to choose what to write about. The book’s primary goal is to educate readers on how the beauty industry is rooted in capitalism and the patriarchy — and why that’s complete crap. Jes gives us countless examples of how the media uses fat-shaming to perpetuate gender roles and to keep women subservient. She also gives tips on how to battle our insecurities to reach self-acceptance. I especially enjoyed the chapter of the book that explored how the health industry helps perpetuate beauty standards. Jes makes sure we understand that fat bodies can be unhealthy and that fat bodies can be healthy. Oftentimes, doctors misdiagnose serious medical conditions because they become obsessed with the idea that if their patient would just lose weight, then their health problems would be solved — and this mentality is not entirely their fault. It’s such a fascinating chapter full with facts and figures. Fat Girls also includes a host of guest essays from other established body positive activists. Virgie Tover dives into the dangers of diet culture, spoken word poet Sonya Renee Taylor discusses how race impacts body positivity, and Andrew Walen explores body image and insecurities in the context of masculinity. Each chapter written by Jes is followed by a guest essay, which serve to enhance and complement Jes’ words. "Today's body positivity focuses too much on affirming beauty and not enough on deconstructing its necessity." Although we’ve made much progress, Jes still has qualms about society’s body positivity movement, and I do too. Jes believes we don’t put enough emphasis on the question “Why does our physical beauty need to hold as much stake as it does, not only just for how others see us but also in the way we perceive ourselves?” Fat Girls is a book that will make you think — like really, REALLY think — and that’s something we need. Overall, this is an incredible book and I would encourage anyone of any size and any gender to check it out. You can read more of Jes’ work at her blog, The Militant Baker.